» Review: Frigidaire FFGF3053LS 30 Inch Range – What Replaced It? 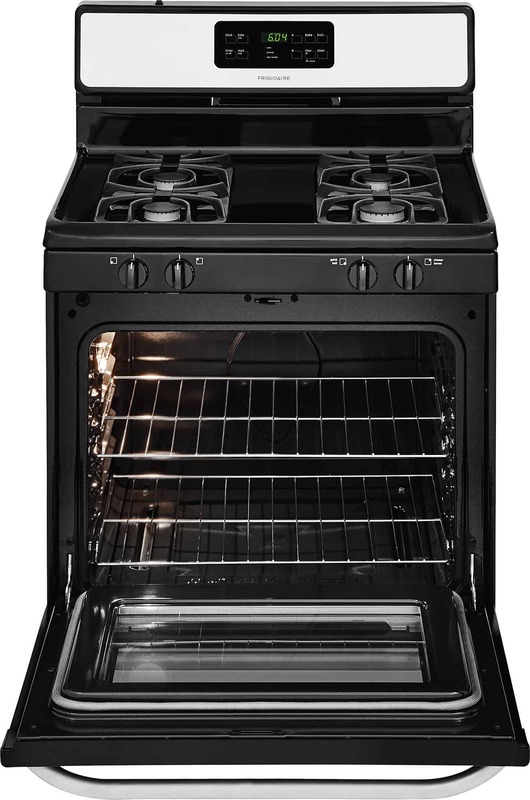 The FFGF3051TS is a good fit if you’re looking for a new gas range, but know that you don’t want or need a high-end “pro-style” range. You just want something well made and easy to use. If you’re in a hurry and want to just see the FFGF3051TS in the store, you can see it at Abt.com here. Abt (BBB Rating: A+) has been selling appliances online in the United States since 1997 and in the Chicago store much longer (see more at the end of this review). Abt offers free shipping in the continental U.S., a low price guarantee and extended warranties. You may use the table of contents here below to select a specific area of this review that you are most interested in, or just read through the whole post. What About Frigidaire Ranges, Where Are They Made? What Are The Continuous Grates? How Many Rack Positions Are There? What About The Broil Drawer? Does The Oven Light Work When The Door Is Closed? What are the timing features? What Are The Exterior Range Dimensions And Weight? Can A Glasstop Be Purchased For The Range? The FFGF3051TS has a lot of the features that some of the higher priced “pro style” ranges have, but at a much lower price. This review will go over all of these features and benefits and help you to decide if this is the right range for you. Frigidaire was founded as a refrigerator manufacturer in Fort Wayne, Indiana in 1916. It was originally called the “Guardian Frigerator Company” until it was acquired by General Motors in 1918, and shortly thereafter re-named Frigidaire. Frigidaire was owned by General Motors (GM) for over 60 years. During that time, it became one of first companies to introduce a compact 30 inch range, in 1950. GM finally sold Frigidaire in 1979 to White consolidated Industries (WCI). Swedish appliance powerhouse Electrolux acquired WCI, and through it, Frigidaire, in 1986. Electrolux still owns Frigidaire, but Frigidaire is still based in the United States and headquartered in Charlotte, North Carolina. Frigidaire ranges are designed, engineered and assembled in the United States. These ranges have a high reputation for quality, with some dealers rating them among their most reliable brands. The FFGF3051TS is an all gas range with four burners on the rangetop and a main 4.2 cubic foot gas fueled oven and separate Broiler Drawer below. The four burners vary in power from 5,000 BTUs in the right rear position to 16,000 BTUs in the right front (the FFGF3053LS only had 14,000 BTUs in the right front burner). This high powered burner located in the right front is perfect for fast boiling or searing and is known as the “Quick Boil” burner. The 5,000 BTU burner is a simmer burner designed for slowly cooking delicate sauces or for melting applications. The left burners are 12,000 BTUs in the rear and 9,500 BTUs in the front. The left rear burner in the FFGF3053LS was 9,500 BTUs, so Frigidaire has increase the power in the left rear quite a bit. These burners are all sealed burners, easier for cleanup but not as high powered as the highest powered open burners found on other ranges. You’re probably not going to notice the difference though, unless you’re trying to do some really high temperature searing. The continuous grates are oven grates that fit together on the FFGF3051TS in three pieces to makes one “continuous” grate for you to easily move cookware around the surface of your range. The continuous grates are all on the same level and helps when you want to use your surface burners with large cookware. Just put a large griddle on the continuous grates with multiple burners at the same time. The main oven in the FFGF3051TS is fairly large, measuring 4.2 of cubic feet in the interior (there is a separate Broil Drawer below the main oven to use for broiling). It is fueled by gas, which is typically cheaper to operate than electric ovens are. You can also convert the fuel source to propane. The oven interior is 23 inches wide, wide enough for good sized baking sheets. It is also 17 inches high and 18.75 inches deep. The broiler is powered by a 16,000 BTU burner, a big increase from the FFGF3053’s 13,500 BTU burner. It’s a great way to sear your favorite cut of steak or put a nice crisp to your favorite pie. There’s a lot you can do with this broiler. The “Vari-Broil” broiler system can be set to either “Hi” (550 degrees F) or “Lo” (400 degrees F), depending on what you’re cooking. The bake broiler is powered by an 18,000 BTU burner. This is powerful enough power for almost any cooking application, including putting a nice sear on your food. Another nice feature of the bake broiler in the FFGF3051TS is Frigidaire’s “Even Baking Technology”. This technology is designed to evenly spread oven heat throughout the oven to make sure that your food is evenly cooked. Note though that this is not a convection cooking system. There are five different rack positions to choose from, so you can adjust based on what you are cooking. For instance, lean meats like turkey are best cooked in the bottom of the oven in the first rack position. Baked products like cookies are best in the middle positions. The Broil Drawer will crisp, brown or toast your food when used with a broiling rack when you put it in drawer. The drawer below the main oven. The FFGF3051TS Broil Drawer uses the Broil & Serve™ system for better broiling. Note that the Broil Drawer is a significant change from the FFGF3053LS. The FFGF3053LS also had a drawer in the same location as in the 3051TS, but it was only a storage drawer. It had no heating elements at all. The oven door automatically turns the oven light on. You can alternatively turn the light on when the door is closed with a button on the top left side of the range. It’s great to know that you can use the light whenever you need to so you don’t have to open the oven door. You can just look through the extra large Visualite® window to check your food. That way, you won’t have to lower the oven temp when you open the door. The oven controls allow you to set the oven temperature, mode, your choice of Fahrenheit or Celsius display and a timer. Note that the timer will not turn the oven off or on, it just gives you a countdown to time your cooking. The exterior oven dimensions are, 29.875 inches wide, 25.75 inches deep and 46.56 inches high when measured to the top of the control surface. The height of the range can be adjusted to allow for uneven floors, so these height measurements are approximate. You should also note that this range weighs about 155 pounds. It used to be, but now you have to order it when you place your range order. The kit should cost no more than $50 and is pretty easy to install. Good to know for those who have better access to propane than to natural gas. The specific model number for the propane kit is PN# GRLP4. The finish is stainless steel with black matte accents on the control panel and in different parts of the range. The rangetop features black porcelain to protect it against heavy use. 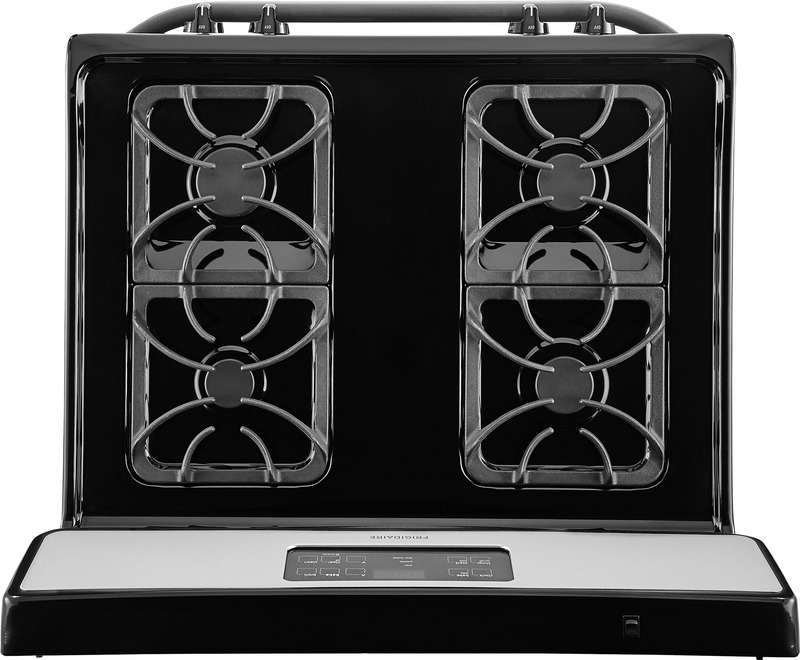 The four oven grates are each cast iron with a black matte finish. The FFGF3051TS does not have a self-cleaning function. There is no glasstop accessory or option available for the FFGF3051TS. The voltage for this range is 120v. The oven vent is located just below the main portion of the control panel above the rangetop and just below the “FRIGIDAIRE” label. You can see it in the picture of the control panel above. You should note that the vent is located in the center of the seam area. It is between the control panel and the rest of the range, so don’t block it with anything. Warm oven air will be coming out of that area so don’t put anything in front of it. Also, like many other ranges, the FFGF3051TS has a unlock switch on each of the two hinges. By unlocking them, you can remove the oven door for direct access to the interior for better cleaning. The highest temperature setting on the oven is 550 degrees Fahrenheit or 287.8 degrees Celsius. The warranty on the Frigidaire FFGF3051TS is a one year limited warranty. Extended warranty protection is available at Abt.com, see details in the purchase options below. The FFGF3051TS is a solid range for the price and manufactured in the U.S.A. by longstanding range manufacturer Frigidaire. For everyday cooking, both on the rangetop and in the large oven, this range will give a lot of features for the price. It’s also good to know that this range is very reliable, but even better with an extended warranty. See the latest pricing, any discounts, free shipping options, a low price guarantee and the extended warranty options on Abt.com here. If you really want to have a convection fan and temperature probe in your oven, then this range doesn’t have them. You might want to consider other options for those features, including the Frigidaire FGGF3059TF. Abt.com was founded in 1936 in Chicago by David and Jewell Abt. Abt has been selling online at Abt.com since 1997, about as long as Amazon. Abt has a Better Business Bureau (BBB) Rating of A+.